Don’t invite thieves in when you go away on holiday – make sure your home is left secure. “When you’re caught up in the excitement of packing to go away on holiday, it’s easy to become complacent about home security,” said Cllr Jill Cleary, New Forest District Council portfolio holder for Housing and Communities. “Make sure your windows, doors, shed, garage and gates are all secure; don’t leave valuable items such as laptops on view through the windows; fit a burglar alarm and security lighting; and store your valuable outdoor equipment and tools in locked outbuildings. 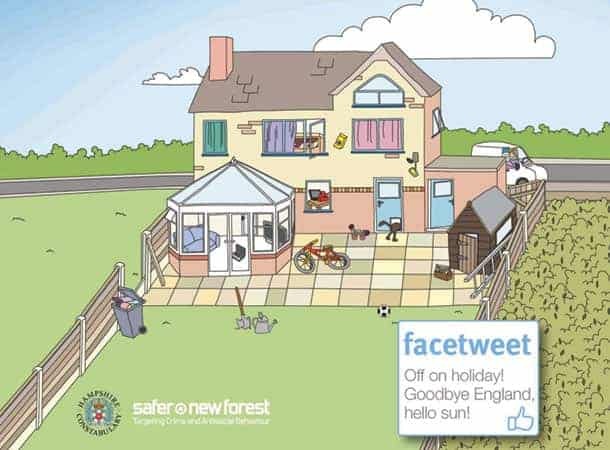 Look out for the Safer New Forest poster ‘Can you spot the risks?’ on public noticeboards around the district for more reminders of house security risks. New Forest Chief Inspector Simon Tribe said: “You can deter intruders from gaining access to your empty home by remembering simple security measures. “Ensure your valuables are property marked and take a photo of them, and make a note of serial numbers on items such as bikes and computers. The Safer New Forest Partnership offers residents a high quality alarmed padlock for £10 which can be purchased at New Forest District Council information centres. Secure your bikes in a locked shed or garage – don’t leave them on view. The Safer New Forest Partnership sells a gold standard D bike lock for £16, available at New Forest District Council information offices. Keep your garden hedges and shrubs trimmed to allow neighbours and passers-by to see the house – and any suspicious activity.